Nearly one in every 14 standing trees in Colorado forests is dead, according to the latest report on the health of the state's wooded areas. The study, released Wednesday by Colorado State Forest Service out of Colorado State University, calculated an estimated 834 million dead trees, many of them succumbing to two beetle epidemics. That's a tree casualty increase of almost 30 percent in the last seven years. Summit County, on the White River National Forest, was a forest system hit extremely hard by the decades-long mountain pine beetle infestation. Scores of lodgepole in the Dillon Ranger District remain in need of treatment. That leaves the region at risk of significant fire danger. 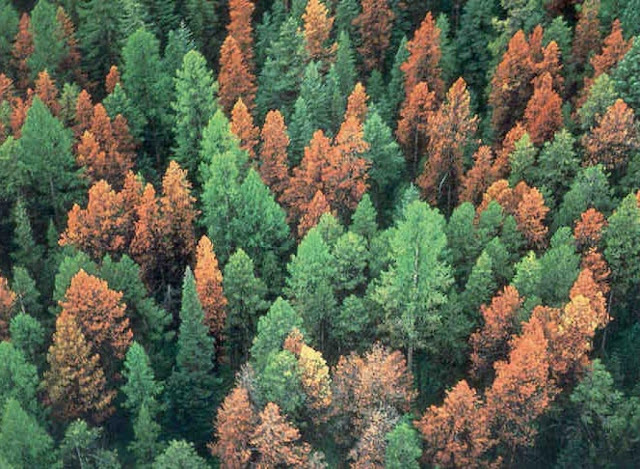 The new report notes that nearly 3.4 million acres across the state are affected by the pine beetle - 143,000 acres of it in Summit dating to 1996. Eagle County has lost 194,000 acres to the mountain pine beetle in that same span, and Routt saw 345,000 acres of logdepole destroyed. The spruce beetle, meanwhile, has not been particularly impactful in Summit, taking out 1,600 acres of Engelmann spruce just below tree line in the last two decades and just 80 acres in 2016. Eagle has lost 6,300 acres since '96, compared to 85,000 acres consumed in Routt. The bug, which is still active, has been much more of a problem in the southwestern portion of the state, especially in the San Juans, but experts say Summit could still be next. "We first saw it south of Breckenridge in 2015, and last year we've also seen it but in really low intensity," said Dan West, forest entomologist with the Colorado State Forest Service. "It hasn't really picked up there yet, but it's not for lack of host type. For lack of a better term, Summit's just kind of in the doughnut hole. However, we're anticipating it in the upcoming and future years to impact spruce there." Such continued destruction is why the local Forest Service unit persists in its work on reducing the risk of forest fires through slash-pile removal, especially in wildland-urban interface, or WUI, areas where residences abut forest lands. The Dillon Ranger District estimates 99 percent of Summit County resides in these zones, making fuel reduction work all the more important. The Dillon District recently proposed a new WUI project in the vicinity of Montezuma Road, Frey Gulch north of Keystone, Keystone Gulch, Tenderfoot Mountain and along Swan Mountain Road. The lodgepole pine so vulnerable to mountain pine beetle makes up 74 percent of the forested area within this proposed Lower Snake project area. "We try to utilize this treatment process where there is the most danger, and the areas most susceptible to catastrophic fire," added Bianchi, who studied forestry in college and is a certified silviculturist with focus on tree cultivation. "The Lower Snake projects address this issue, as well as create more diversity in the landscape to make them more resilient." The Colorado State Forest Service report is based off of aerial forest health reviews, field inspections and surveys of forest landowners. But what can be seen high overhead isn't always the entire narrative about what's going on down below, where the dead and fallen may hide potential new life. It's why Summit's Forest Health Task Force, a volunteer-driven group partnered with the nonprofit Friends of the Dillon Ranger District, heads out to observe and do some "ground truthing" and then reports that data to the local U.S. Forest Service district. "We bring citizen-scientists out to monitor for regeneration and diversity both in plots that have been logged and areas that will be treated by the Forest Service," said Howard Hallman, task force president. "Our longer-term goal is to involve citizens with their local forest, and to educate people about forest conditions locally, as well as provide scientifically-valid information that will help researchers better understand our forest." The present amount of snow should reduce the effects of the spruce beetle if it does in fact come in droves to Summit. This season's high levels of precipitation give Summit trees their best prospects for fending off the bug. "With any luck, that great amount of snowpack will give them a fighting chance to shield an attack," said West. "Tree defenses are closely tied to precipitation levels, and this should be a great year for it - as great as they're ever going to be."